ADKIC set to grab land, land use changes, loss of livelihood, unemployment, and larger resource grab from commons. Growing inequality and distress as per the corporate agenda. Blooming threat to democratic rights of people in states covered by ADKIC. The Amritsar- Delhi- Kolkata Industrial Corridor (AKDIC) is a gigantic project aimed at developing an Industrial Zone spanning across seven states in India. It has been approved as of 20 January 2014 by the Government of India to boost manufacturing sector and agro-processing plants in the country. 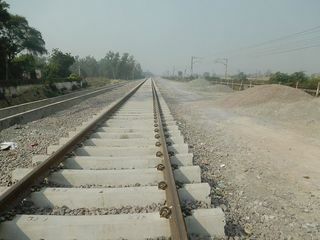 The Eastern Dedicated Freight Corridor (EDFC) (backbone railway of the Amritsar Kolkata Industrial Development Corridor) will extend from Ludhiana in Punjab to Dankuri near Kolkata. The AKDIC will spread across 20 cities which will include the Indian States of Punjab, Haryana, Uttar Pradesh, Uttarakhand, Bihar, Jharkhand and West Bengal. The cities to be covered are Amritsar, Jalandhar, Ludhiana, Ambala, Saharanpur, Delhi, Roorkee, Moradabad, Bareilly, Aligarh, Kanpur, Lucknow, Allahbad, Varanasi, Patna, Hazaribagh, Dhanbad, Asansol, Durgapur and Kolkata. 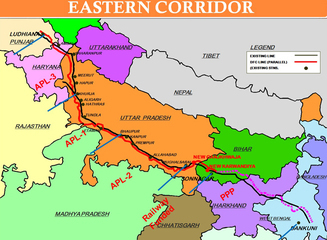 The corridor will be built along the 1839 km long EDFC. It will also leverage the Inland Waterway System being developed along the National Waterway 1 which extends from Allahabad to Haldia. The ADKIC would be implemented in a phased manner and would comprise a belt of 5,50,000 sq. km under influence. 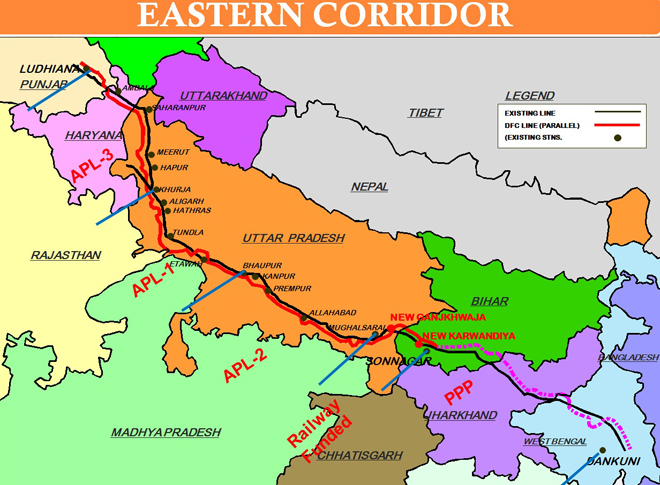 Uttar Pradesh is said to be the biggest beneficiary of the EDFC project with the share of nearly 57% measuring 1049 km that dissects the state through. The first phase of the project is to be a pilot project, during which at least one integrated manufacturing cluster of min. 10 sq. km in each of the seven states will be set up. For this phase, a financial commitment of about Rs. 5600 crores will be provided by the Centre, through budgetary support spread through 15 years. The Centre will provide interest subsidy to states for land acquisition, grant-in-aid for project development, master planning of the manufacturing clusters etc. According to the Cabinet decision, an ADKIC development corporation will be set up immediately with an equity base of Rs. 100 crores. While the Centre will hold 49% stake in the equity, the rest will be owned by the state governments concerned and the Housing and Urban Development Corporation. The Centre is also expected to provide a project development fund of Rs. 100 crores to the corporation. Social movements largely expressed their concerns, not only for the social and environmental impacts of the single components of the corridors plan, but also for the underpinning paradigm that what is to pursue is an economic growth based on large investments and infrastructures. 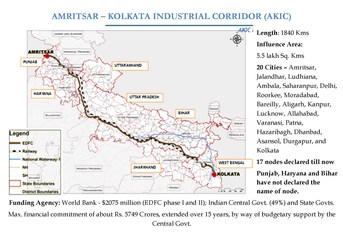 Nodes: The development of ADKIC will be taken up in a band of 150-200 Kms on either side of EDFC, in a phased manner. In the first phase, State could promote at least one cluster of min. 10 Sq. Kms (1000 ha.) area to be called as Integrated Manufacturing Cluster (IMC), in which 40% area would be earmarked permanently for manufacturing and processing activities. Funding Agency: World Bank - $2075 million (for EDFC Phase I and II); Indian Central Govt. (49%) and State Govts. Maximum financial commitment of about Rs. 5749 Crores, extended over 15 years, by way of budgetary support by the Central Government. Current Status: Delhi-Mumbai Industrial Corridor Development Corpn. Ltd. (DMICDC) has been entrusted with the work of undertaking the feasibility study of AKIC as the nodal agency. DMICDC has since identified and appointed M/s LEA Associates South Asia Pvt. Ltd. as Consultant for preparation of Perspective Plan for AKIC Project. The consultant has submitted the interim Report, which has been discussed with the stakeholders. Additional Info: In the first phase, an estimated maximum financial commitment of about Rs. 5749 crores, (for seven IMCs each of 10 Sq. Kms (1000 ha.)) phased over 15 years, by way of budgetary support by the Central Government, is proposed. 4. IMG has recommended a two stage approval mechanism, an “in-principle” and “final approval”. “Final Approval” for clusters will only be considered after SPV obtains possession of at least 75% of the land for cluster. 6. Power – State Govt. to facilitate with full creation of captive power plants by private players with full authority for generation, transmission & distribution; & allow open access to units as per regulations of SERC. 1) Inland Waterways : Allahabad to Haldi NW 1 on Ganga River [Declared] – Haldia (Sagar) – Farakka (560 Kms); Farakka – Patna (460 Kms); Patna – Allahabad (600 Kms). 10 Proposed Junctions Allahabad; Varanasi; Chunar; Patna; Bhagalpur; Karagola; Farakka; Pakur; Kolkata; and Haldia. 6) Highways : NH 2 (Delhi – Kolkata) [Comes under Golden Quadrilateral; NH 2 is four lane and six lane work under progress]. 11) Nuclear Reactor : Narora - River Ganga will be the source of water.